Essential to face painting are face painting kits. 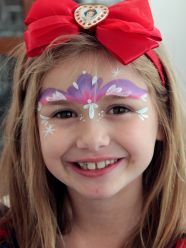 Whether you are a mum who would like to try out face painting for your child’s next birthday party, or you are a little more experienced and would like to know more about advanced kits, you can be certain that the average beginner and professional face painting kits will be both practical and easy to put together. Here are a few basics from the mums and from the experts! For beginners it may become a little overwhelming to decide on the right products for your face painting kits. From choosing the appropriate brands to arranging your kit, one will always do better by imitating the experts at first. The foremost colours that you would be sure to acquire are Black, White, Red, Blue and Yellow. These colours can create every other colour when mixed correctly. This fact comes in handy when you are trying to save money, especially if you are a beginner. However, you cannot rely on this method when you painting at parties, festivals, functions, etc. You simply will not have the time to mix the colours. One can get away with at least 6 colours, though the quality of your work will be very limited. It is generally encouraged to obtain 8 and more colours for the aspect of excellence. The most often used and advised colours for the beginner to have are Black, White, Pink, Brown, Orange, Red, Light blue, Dark blue, Light Green, Dark Green, Yellow, and Violet. The average palette contains 6 colours, and the average professional palette contains 54 colours. 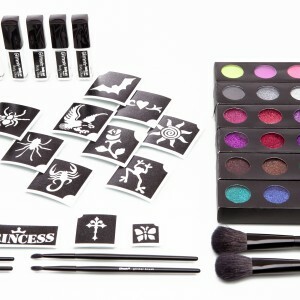 As a beginner, it is highly recommended to have a palette with 8 to 14 colours for you face painting kits. For the Round Brushes, a #2 Round for the finer detail, as well as a #4 Round for most of the line work, dots, curls, swirls, stripes and other detail. For the Flat Brushes, a 1 Inch Flat Brush. These brushes work wonderfully shaped to pick up multiple colours from a splitcake or rainbow cake with one stroke. Try to have two of each of these in your face painting kits, as you may work between them without wasting any time on cleaning the brushes in between the clients. If you are in the face painting business, you must have excellent work as fast as possible. Therefore, more brushes means less time. At least 3 sponges are required for your kit. To practice, one may always cut them in half and have more to work with. Sponges are needed to put fair amount of paint over a big area quickly. It may also be used with split cakes or rainbow cakes. Split-Cakes are cake paints consisting of multiple colours, making it easy to paint with several colours at once. The colours blend easily for professional usage. Use two split-cakes to try them out. Glitters can either make a design look magnificent or shoddy, so be careful as to how and how much you use. Depending on what kind of designs you would want to make, two bottles of Iridescent Glitter or Glitter Powder should be sufficient. Try to purchase Gel Glitter as well, as it helps to have more control over the glitter, if you would like to create thin lines of glitter. Stencils and stamps are really very easy to use, as well inexpensive. This suits the beginner very well, as they do not require a fantastic amount of skill to use properly. 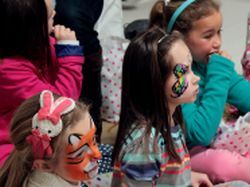 This form of face painting may well help the beginner to get out there into the face painting world, whilst practicing their hand skills at home. The stamps and stencils are also great time savers when the clients are too many for the time given. When storing or using your face painting kits, keep it in a cool, clean, and dry place out of sunlight, with the lids upon every container. 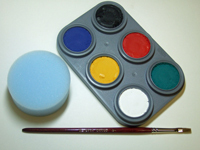 The materials, as well as the face paint containers must always be cleaned at the end of each session. After you finish a session, do wipe any excess moisture from the surface of the face paints, and store the paints with its lids on.The brushes should be rinsed well in hot water and left to dry. Do not put it away any time before.The sponges must be washed well in hot, soapy water and left to dry. Do not put away any time before.Always discard any face paints that have been used for over 18 months.Do not keep badly stained nor damaged brushes and sponges. Discard them immediately. 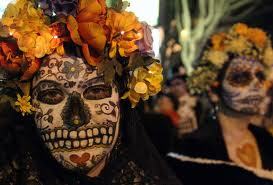 When purchasing face paints, make sure that the products are FDA approved and safe for use on the skin. To help you, below is the contents of most beginner face painting kits, as well as some of the well trusted face painting starter/ beginner kits. 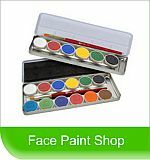 ● 1 Medium Size Face Painting Kit Box. Paints 300 and more faces. 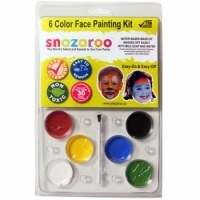 The Snazaroo face paints are vibrant in colour. It applies smoothly, blends easily and will dry in approximately 30 seconds to a streak-free, and durable finish. Snazaroo face paints are non-toxic, hypoallergenic and the world's safest face paints, meeting US FDA, Canadian, and European standards for cosmetic safety. It is the only face paint with a Child Toy Safety Rating. They are easy to use and water-based, fragrance-free and washes off easily. Grimas Face Paints have superb quality as well as amazing coverage power, which makes Grimas an ideal choice for professional use in any of your face painting kits. 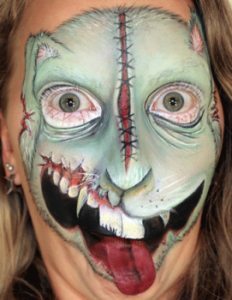 Special FX (Effects) face painting kits are generally used for its intense and vivid colours, which work wonderfully for the purpose of obtaining as realistic a look as possible, or as monstrous. Halloween provides a great occasion to make use of these paints. Special FX paints are very often used for more intricate designs in stage work. A wonderful all-rounder for the basic special effects you need. 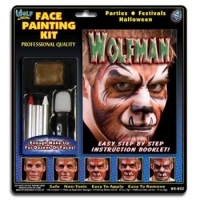 Wolfe Wolfman Face Painting Kits are easy to use. The Wolfe makeup is safe, non-toxic and water based face painting makeup. It does not easily rub off and is comfortable to wear. The Wolfe makeup comes off easily with soap and water. The Wolfe products work great for themed parties for occasions such as Halloween. ● 1 Detailed step by step instruction booklet with colour photos. The Woochie products are perfect for your scary costumes! 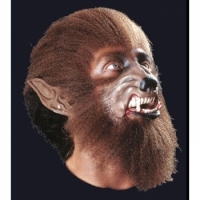 The Werewolf pieces are very simple to apply and with proper care, can be used numerously. It is advised to only be used with children 8 years and older. 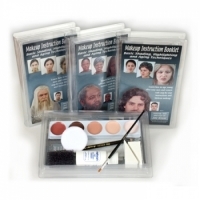 Stage makeup kits are part of the Special Effects makeup line. They are used by cosmetics professionals and the entertainment industry as an asset to a complete stage-makeup supplies. 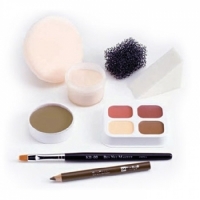 A stage makeup kit is a imperative necessity for any stage performance. Ben Nye Creme Personal Kits includes some practical basics for any character, with a professional quality, a wide range, as well as affordable costs. Ben Nye Personal Kits attribute to highly pigmented, smooth creme foundation, as well as a contour palette with shadow, highlight, rouge and lip color. It applies easily and adapts well to heat, high energy performances and intense lighting. ● 1 Creme Contour Palette, includes Highlight, Rouge, Shadow and Lip Color. Mehron Mini-Pro Student Theatrical Makeup Kits feature Mehron Cream-Blend Makeup, which is often used by the professional makeup artists worldwide. CreamBlend Stick is a highly pigmented, refined cream makeup base, which contain vitamins, as well as antioxidants. With the two base colours, the Mehron Mini-Pro Kit Theatrical Kit allows for greater flexibility in matching and creating varying skin tones. 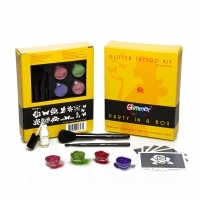 Glimmer Body Art's Princess and Hearts Party in a Box Glitter Tattoo Kit is so easy to use and lots of fun! These glitter tattoos are non-latex, hypoallergenic, waterproof and can last up to seven days. The glitter stencil adhesive is made with a medical-grade adhesive, which prevents any sticky residue on the skin. 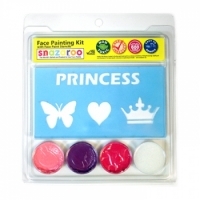 Snazaroo Princess Stencil Kit is a wonderful set for girls face painting. 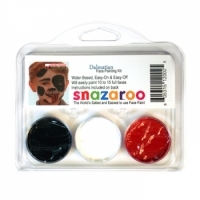 The Snazaroo face paints are vibrant in colour. It applies smoothly, blends easily and will dry in approximately 30 seconds to a streak-free, and durable finish. Snazaroo face paints are non-toxic, hypoallergenic and the world's safest face paints, meeting US FDA, Canadian, and European standards for cosmetic safety. It is the only face paint with a Child Toy Safety Rating. They are easy to use and water-based, fragrance-free and washes off easily. The Snazaroo Mylar Stencils are durable, reusable and easy to clean. 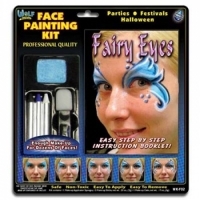 The Wolf Fairy Face Painting Kit is easy to use and works perfectly for painting fairy designs. The Wolfe makeup is safe, non-toxic and water based face painting makeup. It does not easily rub off and is comfortable to wear. The Wolfe makeup comes off easily with soap and water. 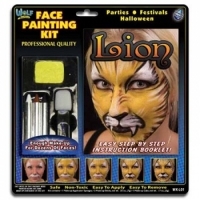 The Wolf Lion Face Painting Kits are easy to use and is wonderful for painting the lion designs. The Wolfe makeup is safe, non-toxic and water based face painting makeup. It does not easily rub off and is comfortable to wear. The Wolfe makeup comes off easily with soap and water. 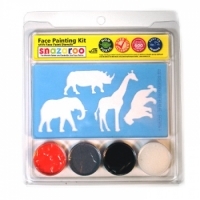 Snazaroo Zoo Face Painting Stencil Kit is a fantastic set for both boys and girls face painting. 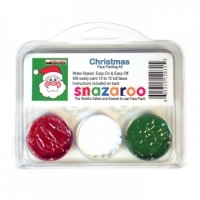 The Snazaroo face paints are vibrant in colour. It applies smoothly, blends easily and will dry in approximately 30 seconds to a streak-free, and durable finish. Snazaroo face paints are non-toxic, hypoallergenic and the world's safest face paints, meeting US FDA, Canadian, and European standards for cosmetic safety. It is the only face paint with a Child Toy Safety Rating. They are easy to use and water-based, fragrance-free and washes off easily. 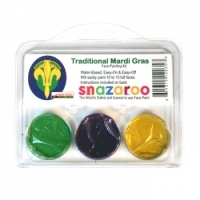 Snazaroo Mylar Stencils are durable, reusable, as well as easy to clean. Snazaroo Dalmatian Face Painting Kits works very well to get that typical puppy face! 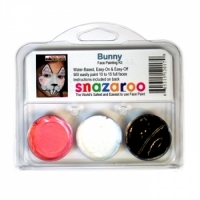 The Snazaroo face paints are vibrant in colour. It applies smoothly, blends easily and will dry in approximately 30 seconds to a streak-free, and durable finish. Snazaroo face paints are non-toxic, hypoallergenic and the world's safest face paints, meeting US FDA, Canadian, and European standards for cosmetic safety. It is the only face paint with a Child Toy Safety Rating. They are easy to use and water-based, fragrance-free and washes off easily. The Glitter Tattoos add a lovely sparkle to any design! It is so easy to use, that you will have your glimmered design ready in no time at all. This can become a great asset to all face painting kits! The Amerikan Body Art UV/Blacklight Glitter Tattoo Kits work wonderfully for any glitter party! They are well suited for designs of both boys and girls. Blacklight glitter is bright under normal light while fluorescing under black light. With the proper care, these stencils may be used several times. All the Amerikan Body Arts polyester glitter is made in the USA and is safe for use on the body, as well as the face. Glimmer Body Art's Blossom in a Box Glitter Tattoo Kit is both easy to use, as well as heaps of fun for the flowery glitter parties close by. These glitter tattoos are non-latex, hypoallergenic, and waterproof. It may last up to seven days. The glitter stencil adhesive is made with a medical-grade adhesive, which will prevent a sticky residue on the skin. Glitter tattoos should only be used once and are not recommended for use on either the face or eyes. 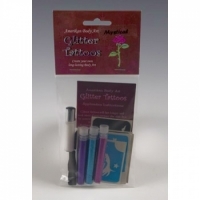 The Amerikan Body Art Mystical Glitter Tattoo Kits will work fantastically for creating unicorn, fairy, or butterfly glitter tattoos. There is enough glitter, as well as adhesive to make over a dozen glitter tattoos. With the proper care, the stencils may be used several times. All the Amerikan Body Arts polyester glitter is made in the USA and is safe for use on the body, as well as the face. 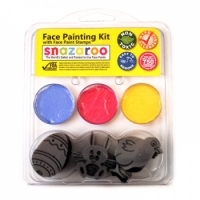 Snazaroo Easter Stamp Kit is a lovely set for spring and Easter face painting. Snazaroo EVA Stamps are approximately 1 inch thick and 1.5 to 2 inches tall, the ideal size for face painting on children, making this a wonderful addition to any of you face painting kits! 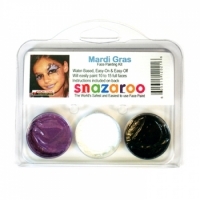 Snazaroo EVA Face Paint Stamps are made of durable foam for easy cleaning, and multiple reuse as well. The Holiday Face Painting Book has 50 original, extraordinary but simple holiday face paint designs from Christmas, to Hanukkah and Kwanzaa, Canada Day to the celebration of Queen's day . All these face painting designs are done by Marcela Murad, one of the pioneers in the face painting world. These step-by step instructions are easy to follow so that you can face paint your holiday in a snap, from beginner Valentine's hearts to advanced Christmas face painting designs. ● 1 Sturdy plastic traveling case. When you are ready to take a bolder step into the face painting world, then the purchasing of Professional Face Painting Kits will be well needed to ensure an expert look on all your designs, so that you may take the right steps into your face painting business venture. 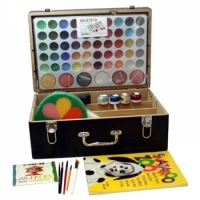 The 54-color Professional Palette Face Painting Kits case has room personalize your kit, as it contains top compartment also. With the main section dividers, you can remain organized! Snazaroo 54 color palette all in a sturdy wooden case. 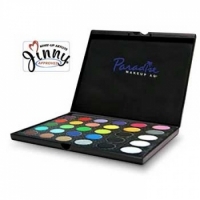 The Paradise Makeup AQ 30 Color Palette is a laptop style palette. Paradise Face Paints are moist, semi-soft cake makeup, with bright colour that dries fast with minimal rub-off. These face paints are easily blended and washed off. Paradise AQ Makeup includes aloe and chamomile and the enriching emollients glycerin, avocado oil, as well as cocoa butter. It is safe and gentle on skin. The 30-color Paradise palette container makes it easy to set-up, as there are no lids to remove, and every colour has a large surface area for use with a sponge or a brush. The colours included are Black (3), White (3), Red, Yellow, Dark Blue, Dark Green, Orange, Dark Brown, Teal, Light Green, Dark Pink, and Purple, Lagoon Blue, Beach Berry, Mango, Amazon Green, Lime, Storm Cloud, Wild Orchid, Coral, Light Pink, Light Brown, Light Blue, Violet, Gold and Silver. TAG Face Paint is easy to blend, soft on the skin and neither cracks nor peels. Most of the TAG face painting colours are great for line work. The lighter face painting colours show very well, even when it is over darker colours. The TAG face paints have a wax base, so that the face painting design flexes with the movement instead of cracking. TAG is known to be a very soft and creamy face paint. I also requires less water to activate than some other face paints. This product is hypoallergenic, and made with non-toxic, US FDA approved, skin safe ingredients. 12 x 32g TAG regular face paints including White, Black, Red, Orange, Brown, Pink, Green, Light Green, Light Blue, Purple, Royal Blue and Yellow. 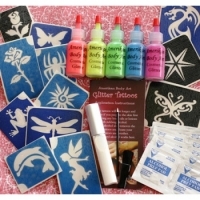 This particular kit is specifically designed for the Glitter Tattoos Artist. The Glimmer Pro Kit is a wonderful kit for all Glitter tattoos artists. It is designed for Professional Glitter Tattoo Artists and is perfect for parties and events, whereby an hourly fee can be charged to the client. 4 Sets of Glitter Tattoo Brushes - Specially designed to pick up & paint-on glitters. This particular kit of the Glimmer Face Painting Kits is specifically designed for the Glitter Tattoos Artist. 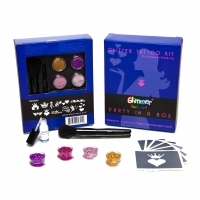 The Glimmer Business Kit is a professional kit that covers all the bases for getting started as a Glitter Tattoo professional. You can create over 500 glimmer tattoos with this kit, however additional Glimmer Tattoo Stencils are also needed, as well as recommended. 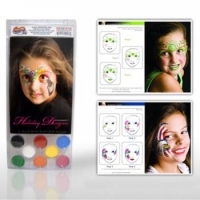 These face painting kits is designed to accommodate large events where fast face painting is required. The practicality of the Fundraiser Fast Faces Kit shapes this kit into a fantastic product! Several painters are able to share the products and paint simultaneously, quickening the face painting between everyone. With the range of face painting stencils, this kit works superbly for all ages and events. Although the Fundraiser Fast Faces Face Painting Kits are not professional kits, and can be used by anyone, it does suit for the professional business, as it allows for large events.With the choice of multi coloured fast face designs, or adding embellishments with the colours and glitters, you can exercise your artistic speed and skill for the benefit of you creative designs. 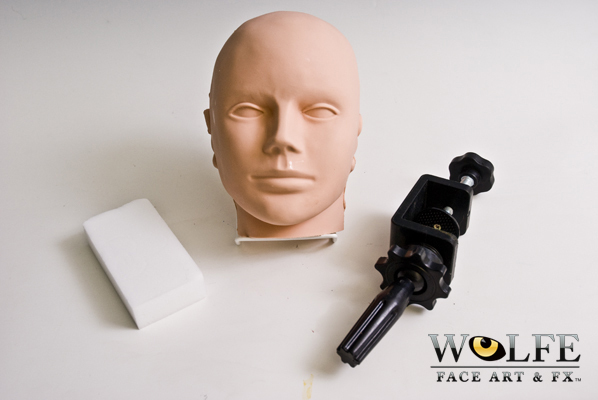 Practice heads are well known in the face painting world as a perfect way to acquire the best practice. Practice head usually washes off easily and makes an ideal use for any face painter.